What makes Jan. 6 a major date in Kansas UFO history? Sixty-nine years ago, there were three separate and seemingly unrelated UFO-related events that took place — one near the small town of Howard in southeast Kansas, another near Olathe in northeast Kansas and a third involving a Kansas City, Kansas, newspaper. The first occurred during the morning of Jan. 6, 1950. Three Air Force officers who were flying north over Kansas near Howard on their way to Nebraska saw and reported a strange oval-shaped craft, sort of like a silver football with a red nose, flying silently underneath them at more than double their speed. The second took place later that evening starting near the military contractor Bendix’s plant in Kansas City. Two employees of the plant saw a strange light with a red light emanating from it. They chased it by car to what was then a U.S. Navy air station south of Olathe. And a third was the Wyandotte Echo newspaper’s report of a UFO story that seems to have triggered the government’s first documentation of the classic case known as the Aztec Crash — a New Mexico UFO recovery case that is still highly debated by UFO researchers today. Project Blue Book reports indicate the newspaper story led investigators on a cross-country chase to find the source of the story. Even the FBI was involved. You can read more details of all three still unsolved cases in my book “UFO Cold Cases: Kansas,” which covers many of the 701 incidents marked “unknown” from “Project Blue Book.” Get your copy in ebook or paperback form at Amazon.com. Dodge City is usually known for its tales of the Old West, Boot Hill, real characters like Wyatt Earp and Doc Holiday, and fictional TV characters like Matt Dillon and Festus Hagen. But in October, the historical western Kansas city is a place you can go to learn all about weird stuff from Kansas’ past, including ghost stories and even UFOs — it’s Weird History Month at the Dodge City Public Library. I talked about spooky tales of visitors from Venus chronicled in a Kansas City newspaper. Large shiny disks and strange lights darting around military planes and jets near Clay Center, Kansas City, and Olathe. Even a sighting of a UFO pilot just before his saucer-shaped craft darted off into the sky over Pittsburg. I think the gathering enjoyed the stories out of Project Blue Book. Some even spoke of their own sightings during the open session. My thanks go out to all those who attended and to the library’s Michael Biltz for setting it up and promoting it. See the Facebook Live video from the event. You might have known “flying saucers” were first seen in 1947 — but did you know Kansas had an “unknown” UFO cold case just days after one allegedly crashed that year in Roswell, New Mexico? I’ll be talking about that early case Wednesday, Aug. 24, at the first luncheon forum of the semester at the Ecumenical Campus Ministries building at the University of Kansas. There’s a small charge for the lunch, which begins at 11:30 a.m., but the program, which begins at noon, is free and open to the public. I’ll present highlights from my book, UFO Cold Cases: Kansas, which goes into detail about 10 formerly classified UFO cases — real-life X-files — taken from the pages of Project Blue Book, the Air Force’s 20-year investigation of UFOs. I’ll also give a few highlights about current Kansas sightings. It might be the scared look in their eyes. It might be their unwavering story. It might be their own uneasiness of what you’ll think of them. But the credibility of many of the witnesses are the reason I continue to keep looking for answers as I research UFO Project Blue Book sightings in the Midwest. As a skeptical journalist, I have have to carefully weigh everything I read about UFOs, abductions, aliens and government coverups. So I’ve concentrated my reporting on cases that were actually investigated by the Air Force, usually under a national security veil of secrecy. “Does Dave really believe this stuff?” my wife told me she was asked by one of her friends. My answer: When I first started research for my book, UFO Cold Cases: Kansas I was expecting to be a debunker. But then I would read the sworn statements of witnesses. Many seemed to have nothing to gain. They were worried about public ridicule. They included a man who saw a strange craft in 1952 hovering north of Pittsburg, Kansas. And two men who chased a UFO in 1950 after getting off work at their jobs in the old Bendix plant in Kansas City. I would want to know more — but there was no follow-up on the most promising cases. Such cases were just marked “unknown. There were 701 of them in the Blue Book files. And those have made me uneasy and suspicious. I can’t be satisfied that our government hasn’t been holding back information, despite assurances there was nothing more to investigate. I’ve also personally talked to people who have privately told me their own weird, crazy encounters — UFOs they never reported, but knew to be the real thing. Those are the people who keep me going. And I occasionally run across a video of an interview of someone who has come forward after dutifully keeping quiet under military orders for decades. Above, I’ve posted an old video of an interview on YouTube with Jesse Marcel, who many people say was the fall guy in the alleged government coverup of the 1947 Roswell, New Mexico, crash. Was Marcel telling the truth in the video? It’s his story that reopened the Roswell case in the late 1970s and spurred modern-day research into that classic case. Many of the Roswell researchers were to be on hand this weekend at that city’s annual UFO Festival. The credibility of his story just raises more questions. And it’s that reason I keep searching for the truth. Did you know that a day before the Roswell crash was reported in New Mexico, a similar UFO was seen flitting over the Kansas town of Clay Center? I featured the Clay Center sighting — an official government real-life X-files case — in the first chapter of my book, UFO Cold Cases: Kansas. Both cases happened nearly 69 years ago, during early July 1947. That was just a few weeks after the entire country was sizzling with news reports of so-called “flying saucers” seen skipping over mountaintops in the state of Washington. On June 24, 1947, Kenneth Arnold, a private pilot, had seen nine shiny boomerang-shaped objects over the Rocky Mountains near Mount Ranier. And more people around the country began reporting they too saw similar objects and lights. The military was scrambling to find out what they were: Our own secret experimental aircraft or balloons? Russian aircraft? Misidentified objects? Or something else — perhaps even extraterrestrial visitors? In the Kansas case, a seasoned combat pilot was on a routine military flight when he spotted a shiny object about 100 miles west of his Kansas City destination over the town of Clay Center. It was in broad daylight and in good weather. It shot away and disappeared when he tried to follow it. I go into his statements and the circumstances in detail in my book. What was strange was how quickly the military tried to downplay it and even dismiss it. And how there seemed to be no effort to go on the ground and find out if anyone in that town had seen the craft? It was almost as if a UFO playbook had been established early on by the military to explain away any reports of UFOs. That’s what many UFO researchers believe happened in the famous Roswell case. I just visited Roswell last week and toured some of the sites around the city where the alleged government conspiracy took place. The conspiracy story is one of the most famous cases in the annals of ufology. A thunderstorm spewing thunder and lighting takes place on a night in early July 1947. A rancher hears a loud explosion that night and goes out to check on his cattle the next day at a rugged desert site about 30 miles northwest of Roswell. That’s where he finds a debris field. That news appears in the Roswell Daily Record and the story goes out over the newswires. However, the very next day, the military backtracks. They say it was a mistake, that it was only a crashed weather balloon. And thus the coverup and conspiracy began, the researchers say. Roswell researchers are convinced the conspiracy is true. Why the coverup? They claim the military was afraid to let the public know about the alien beings found on the ship, for fear of mass panic similar to what allegedly happened during the Halloween 1938 radio broadcast of Orson Well’s Mercury Theatre dramatization of H.G. Well’s science fiction story, The War of the Worlds. The military also didn’t want the rest of the world to know they got their hands on advanced technology. While touring Roswell, the sense I got was that those who allegedly helped the military in the crash retrieval kept quiet because they felt honor-bound to forget what they had seen out of patriotic duty. They were also much more trusting of the government to do the right thing back then. But there were also threats. They were afraid of being not only imprisoned, but killed, if they revealed anything. Some reported they were told it would be easy to take them out into the desert and make them disappear. After five days of being detained by the military, the rancher who found the debris changed his story. And the radio station owner was warned if he broadcast his original taped interview with the rancher, the station would lose its FCC license. More details on the Roswell story are easily obtainable online or by visiting the International UFO Museum in Roswell or by reading one of the books by Stanton Friedman, the original Roswell civilian investigator. Friedman is one of the speakers at Roswell’s annual UFO Festival June 30-July 3 in remembrance of the incident. While much ado has been made of Roswell, there’s been very little written about the July 6, 1947, Clay Center incident, which was marked as a Project Blue Book “unknown” case. I found it very odd that the government just dropped it and did no follow-up on the ground — at least that we know about. In light of what Friedman and others have uncovered about the Roswell case, it might be time to take another look at the Clay Center case. I laughed, choking on my coffee when I saw it — a tweet linking to an online article that said Obama was going to give us the truth about UFOs by the end of the year. OK, if he does that will be wonderful. • That our deeply compartmentalized military and spy agencies have been hiding the truth from us under the guise of national security since 1947 or even earlier. • That we have been visited by extraterrestrials or by beings from another time or dimension. • That their captured technology could provide us with free energy — and even flying cars. Or there’s the flip side. Obama might tell us there’s nothing to it, that all the UFOs were actually secret government projects, natural phenomena, balloons, birds, hoaxes, hallucinations or swamp gas. We’ve been down this route before. President Bill Clinton was going to give us the truth back in the 1990s. He said he couldn’t find anything. And earlier this year, Hillary Clinton made a campaign pledge to open up our UFO X-files and tell us what’s really going on at Area 51 — unless it might hurt national security. That’s the key — national security. The need to know. That’s why I choked on my coffee laughing. Think about it: Would Obama really come clean? Would he really confess that he’s been part of a government conspiracy during his eight years in office that has been hiding the truth about the real nature of UFOs? While doing follow-up research to my book, UFO Cold Cases: Kansas, I’ve found that the whole notion of national security and swearing military and government workers to secrecy oaths has made us skeptical of almost anything that comes out of a government official’s mouth. UFO conspiracy is something of a cottage industry. It’s hard to flip through the TV channels without finding the latest cable TV documentary on secret UFO files. Those who put together the documentaries never give it to you straight — they always put in dramatic music, dramatized scenes and special effects. Yes, it makes it more interesting. But it also hurts their credibility and authenticity. In my book, I went back to the early days of the our government’s first investigations into UFOs. I wanted the real thing. I re-examined 10 documented real-life Kansas UFO X-files, including some tied to more famous cases, such as the early July 1947 Roswell incident. 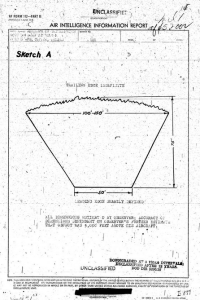 As I pored through the old Air Force Project Blue Book documents, I found that credible, serious people, including military pilots, were seeing unbelievable things in the Kansas skies. The takeaway? In what would seem to be the most interesting, promising cases, the documents indicated the Air Force just marked them “unknown” and apparently moved on. But did they shove them in a drawer? Or did they hand them off to another agency — or even a private outside contractor — to carry on the investigations? That’s the big mystery. If that’s what Obama is finally going to tell us, then I’m all ears. Meanwhile, I’m going to finish my coffee and get back to the hard work of going through more real-life government X-files for my next writing project. The news of AirEgypt Flight 804 crashing for unexplained reasons over the Mediterranean Sea this week got me wondering about how much we trust our investigators to get to the truth. In the past, I’ve always taken it for granted that investigators would continue their probes into crashes until they found the reasons. But in the last six months, I’ve been reading more and more UFO files. And I’m not finding that’s the not necessarily the case — some air investigations just don’t seem to care about the truth. In my book, UFO Cold Cases: Kansas, I discovered some investigations were apparently dropped by the Air Force’s Project Blue Book investigators before they reached a conclusion — some of the more interesting cases were merely stamped as “unknown” and shoved into a file drawer. Or were they? I got the uneasy feeling that’s all the government thought the general public was entitled to know. If the investigation was handed off to another agency, we were never told. If that agency found anything, we would never know. And despite recent revealing statements from people who were ordered not to say anything for national security reasons as long as 60 years ago, we still don’t know for sure. That’s because our military leaders would never officially confirm any UFO sightings might be extraterrestrial visitors. Author and UFO researcher Timothy Good notes in his book Need to Know: UFOs, the Military, and Intelligence that there were an unusual amount of military and civilian air crashes that took place in the 1950s. Most were officially ruled accidents and attributed to pilot error or equipment failure. But Good claims in some cases, pilots had been ordered to to shoot down UFOs — and were themselves shot down by superior alien technology. Good charges our government — and many other governments aligned with the U.S. — have made it a policy to not let the public know about UFOs retaliating against aircraft that attack them. After reading his theories and his supporting documentation, it’s led me to be skeptical about what we’ve heard this week concerning AirEgypt 804. As of Friday night, we’ve been told the airliner basically fell out of the sky and disappeared into the sea, killing all of the 66 people aboard. Why, we still don’t know. Republican presidential candidate Donald Trump immediately blamed it on Islamic terrorists, without any evidence. And investigators were checking to see if a bomb could have been smuggled aboard. It is easy to be like Trump and blame such accidents on international terrorists groups like ISIS. But it could also have been a lone bomber with a grudge against someone on board. Or maybe the plane hit a U.S. unmanned drone with a warhead. Or a flock of birds, a meteor or even a UFO. Anyone can speculate. After reading Good’s book, it started making me question everything military authorities tell us. Since Project Blue Book ended in 1969, authorities have most of us convinced extraterrestrial crafts are a figment of our collective sci-fi imaginations. It wasn’t always that way. There was a time when the military took UFOs seriously, at least seriously enough to conduct numerous investigations. This summer, we’re coming up on the 69th anniversary of a real-life X-file where a lauded military pilot spotted a UFO on July 6, 1947, as he flew over Clay Center, Kansas. That was just a day before the government first announced it had captured a flying saucer July 7, 1947, in Roswell, New Mexico, then said it was a weather balloon the next day. I wrote about the Clay Center incident in Chapter 1 of my book. My frustration with that particular investigation was that they seemed to want to explain away the sighting, rather than consider it might be a real aircraft the pilot saw. They were trying to write it off as a reflection of the sun — even though similar circular objects were being seen all over the country that week. Hopefully, the international team of flight investigators will get to the bottom of the AirEgypt disaster in a timely matter. But knowing what we know how the truth may be hidden from us — based on what they perceive as our need to know — we should demand they show us evidence of their conclusions. If you follow politics at all, you probably noticed this tidbit: Hillary Clinton was quoted by the New York Times as saying she promises to get to the truth about UFOs. Actually, she used the term UAP, or Unexplained Aerial Phenomena, which she says is the latest terminology. Clinton gets some points for being a ufology wonk. And she might get a few votes — more than a third of the population believes UFOs are real. But whether she calls them UAPs, UFOs, aliens or flying saucers, it’s unlikely Clinton will make good on that promise if she makes it to the White House. That’s because other presidents — including her husband, former President Bill Clinton — have made similar promises. — Or our presidents have always known the truth but have been convinced they need to continue concealing it from the public for reasons of national security. So if they think you don’t need to know, they won’t tell you. That’s why I like to get away from what politicians say and examine official government documents in my own research. I did just that with the Project Blue Book case files in my book, UFO Cold Cases: Kansas. In the book, I re-examine 10 documented real-life Kansas UFO X-files. Most of the documents were kept secret. And many of the military pilots or technicians involved were initially told they couldn’t talk about their own cases to the media because of national security. But all the secrecy has led to conspiracy theories. I don’t like to spread conspiracy theories. But I don’t mind examining them for any grains or truth. For example, there are theories that President Eisenhower actually met with aliens during the early 1950s. That theory arose in 1952 after UFOs buzzed Washington, D.C., and showed us they could run rings around our fastest nuclear missiles. Ike also had some missing time while on “vacation” in California that was explained away as an emergency visit to the dentist. But the conspiracy buffs say he used that time to meet with aliens. Another story was that Richard Nixon, who was vice president under Eisenhower, was the last president to know the whole story about UFOs. The source was a tabloid story quoting TV and Hollywood star Jackie Gleason who claimed Nixon actually showed him an alien being kept in a government facility. We know President Jimmy Carter claimed he saw a UFO, and tried to get more information about it. Also, President Bill Clinton tried to find out what was going on at Area 51. As far as we know, neither Carter nor Clinton were able to turn up anything about UFOs and aliens. So we keep coming back to the conclusion there’s nothing to the stories — unless, of course, there is something to them and we can’t know for national security reasons. When Hillary Clinton says she’s going to seek the truth, about all you do is ask her what she’s going to do that past presidents haven’t done. If Bill Clinton or Jimmy Carter couldn’t find anything, how does she plan to unravel seven decades of secrets? Also, as secretary of state, wouldn’t she have already known about our dealings with other governments — including any agreements or treaties with have with extraterrestrials? All we can do is take her at her word. If she is elected president, she’ll look into it. And that takes us right back where we’ve been since the Roswell crash in 1947. One reason she might be talking about UFOs now is because her new campaign chairman is John Podesta, a longtime advocate of finding out the truth concerning UFOs. Podesta should have been able to find out the truth in his past White House jobs — he was President Bill Clinton’s chief of staff and served as counselor to President Barack Obama. The following is what he said back in 2002 — 14 years ago.